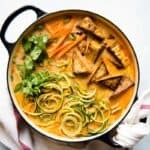 This delicious noodle soup is one of my absolute favorites right now. The broth is made with a bunch of aromatic herbs and spices, tomatoes, and coconut milk, which give the broth subtle sweet flavor. Serve the noodles with pan-fried tofu, and you’ve got a delicious meal in under 45 minutes! Even though it has been another hot summer in Sacramento, I still enjoy eating noodle soup for dinner. For example, this zucchini noodle soup is something I made many times in the last few weeks. It is one of my favorites. 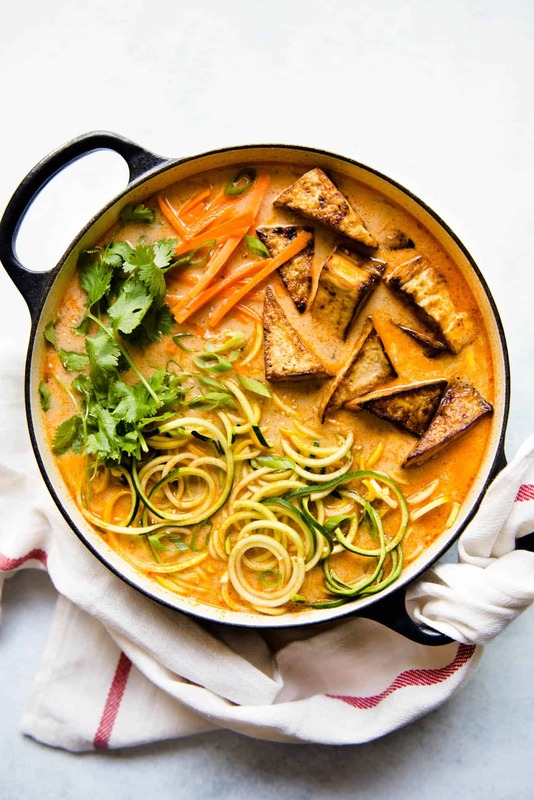 I made a rich broth out of tomatoes, coconut milk, and fragrant herbs and spices, and tossed in a ton of zucchini noodles to keep the dish light. This noodle soup is truly a celebration of summer produce. For protein, I serve the noodles with pan-fried tofu, a recipe that I learned from Andrea Nguyen’s The Pho Cookbook. When I first tried her recipe, I was pleasantly surprised by how little oil was required to sear the tofu—just 1 tablespoon. Furthermore, even though the flavoring of the tofu consisted only of 1 tablespoon of soy sauce, I found the tofu pieces to be quite flavorful. The tofu is even better when you steep them into the broth! CAN YOU MAKE THIS WITH OTHER NOODLES? Yes, absolutely! You can use dry noodles, such as rice noodles, or even butternut squash noodles. I would cook the dry noodles separately in a pot of boiling water because they can absorb a lot of water. I prefer noodle soups served with copious amounts of broth, so I don’t want too much of that broth to be soaked up by the noodles. To pan fry the tofu, make sure you use a nonstick pan to prevent the tofu from sticking to it. If you want a spicier broth, add 1/2 to 3/4 teaspoons of red chili flakes or 2 Thai chilies (sliced) the same time that you add the ginger and garlic. Remove the block of tofu from the package and wrap it around a layer of paper towels. Place the wrapped tofu on a plate and place a stack of plates on top. Press the tofu for 15 minutes. Unwrap the tofu and cut it in half, crosswise. You should have 2 short rectangular blocks. Slice each block into 4 slices so that you have 8 pieces total. Cut each slice on the diagonal so that you end up with 16 triangles. Pour the soy sauce into a large nonstick pan. Take a piece of the tofu, and drag it around the soy sauce. Flip the tofu over to cover the other size with soy sauce and leave the piece of tofu in the pan. Continue with the remaining pieces of tofu, until all the soy sauce has been absorbed by the tofu, and all the pieces are in the pan. Fry the tofu over medium heat for about 4 minutes, flipping halfway. It’s perfectly fine if the pan is dry at this point. Add 1 tablespoon of vegetable oil to the pan, and continue cooking the tofu for another 3 to 4 minutes, flipping it halfway. Transfer the tofu to a plate. Trim the ends from the zucchini and make noodles with a spiralizer. Give the noodles several rough chops to make the noodles shorter. Transfer the noodles to a plate. After you make the zucchini noodles, you’ll be left with several cores from the zucchini. Slice the core into thin slices. In a pot, heat 1 1/2 tablespoons of vegetable oil. Add the onions and cook for about 3 minutes over medium-high heat, until the onions soften. Add the ginger and garlic and cook for 30 seconds to 1 minute. Add the tomatoes, sliced zucchini core, and coriander and cook for another 3 to 4 minutes. The tomatoes should have broken down by this point. Add the salt and vegetable broth, cover the pot with a lid, and bring the broth to boil. Stir in the coconut milk. Give the broth a quick taste and adjust the seasoning according to your taste. Turn off the heat and add the zucchini noodles. The heat from the broth should soften the zucchini noodles in a few minutes. 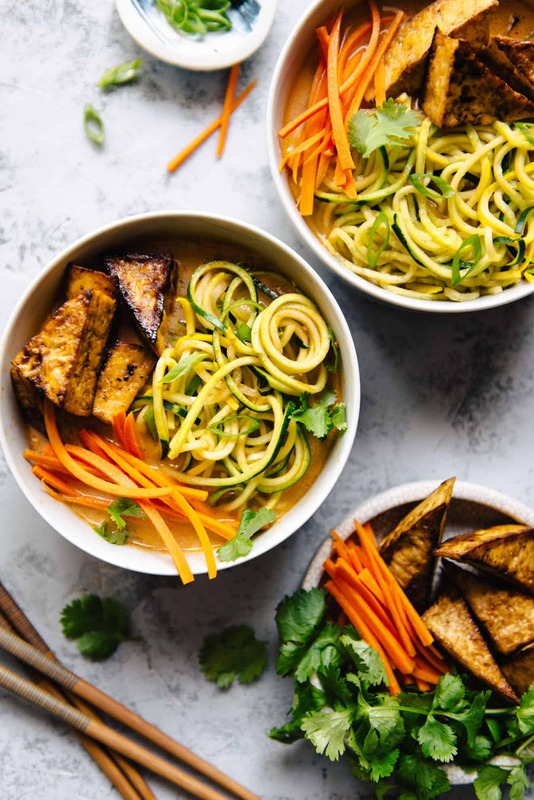 Serve the noodles in bowls along with julienned carrots, sliced scallions, cilantro, and the tofu. 0 Response to "ZUCCHINI NOODLES WITH TOMATO & COCONUT BROTH"